Buy these Mack Brush Series 39 Jenson's Swirly-Q Brushes here. 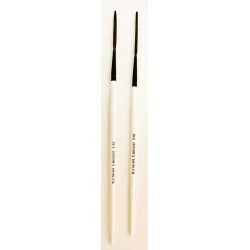 These brushes are available in 2 sizes. "The Jenson's Swirly Q brush is designed for scroll striping and script lettering with enamel based paints. Scroll striping requires thinner paint, if mineral spirits were to be used the paint would run easier. I recommend using a slow drying automotive reducer for enamel based paints, these can be purchased at your local auto body supply. Clean brush thoroughly with reducer before and after each use (do not use lacquer thinner!). Be sure to store your brush in mineral oil between uses." - Gary Jenson Individual Brushes LISTED BELOW!